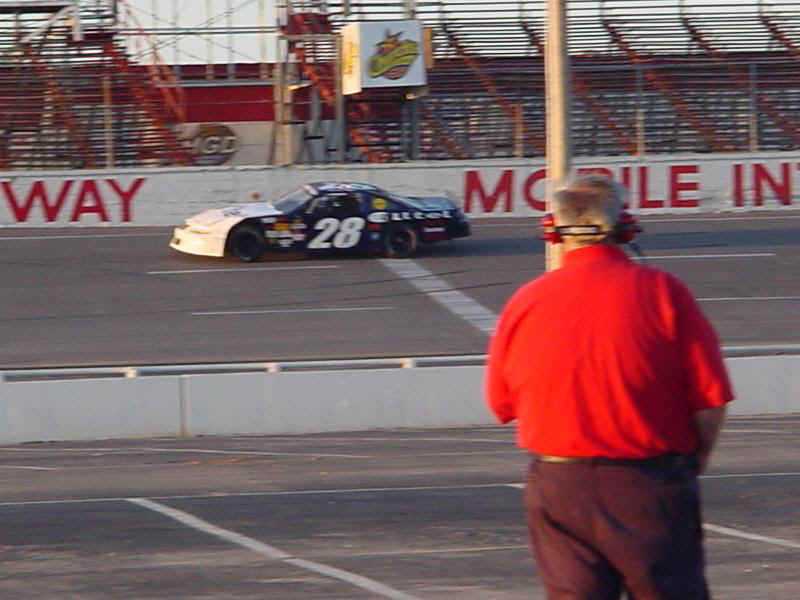 While Thomas has turned hundreds of lap in a race car he took his first laps in a full bodied stock car at Mobile International Speedway in October. After a few laps to get settled in the Moose was loose! Thomas returned to Sunny South Raceway Friday with a 2 week lay off and some wholesale changes to his Outdoor Channel Legend car. Out of the shoot he was fast but loose, we tightened him up a little and he was turning his fastest times ever in a legend car. After a 4th place finish in the first heat race the Vanderley's loaned Thomas a different cut set of tires for use the rest of the night. The difference in cut put Thomas on a rail. In the second heat race he started last and after shaking down the car with the new tires he was on the march and finished 4th. Thomas started 8th in the feature and worked his way up to 4th by lap 19. Trying to take 3rd coming off of turn 4 he scraped the outside wall and spun the car. With 6 laps to go he took up the back of the 13 car field. On the restart the Moose was loose and fun to watch! He was passing cars on the inside on the outside wherever he caught them he passed. With 3 to go he was up to 7th, he passed one car off of turn 2, one down the back stretch and was underneath the 5th place car going into to turn 3. The 5th place car didn't realize he was there and came down on Thomas hitting him in the passenger door. They touched wheels with Thomas getting airborne on 2 wheels and sent both cars spinning. They finally came to rest with the Outdoor Channel on top of the other car and needing a wrecker to separate them and the string of top 5's came to an end. Thomas offered the following on his night; "My car was really good and then DJ loaned me a set of tires and it was awesome. I messed up off of 4, scraped the wall and spun out. It cost us a good finish. At the end I thought the 25 saw me under him but he must not have, we touched and then I was just hanging on. I ended up on top of him and I thought my car was torn up more than it was. We'll be ready for next Friday night." Three race nights in the Outdoor Channel Legend car had produced a string of 8 top 5 finishes. The Moose added 2 more to his total last night for 10 top 5's in 4 nights of racing. Eighteen cars signed in for the legends class Friday night at Sunny South Raceway with racers coming in from Georgia and North Carolina to try their hand at on the 1/4 mile oval. 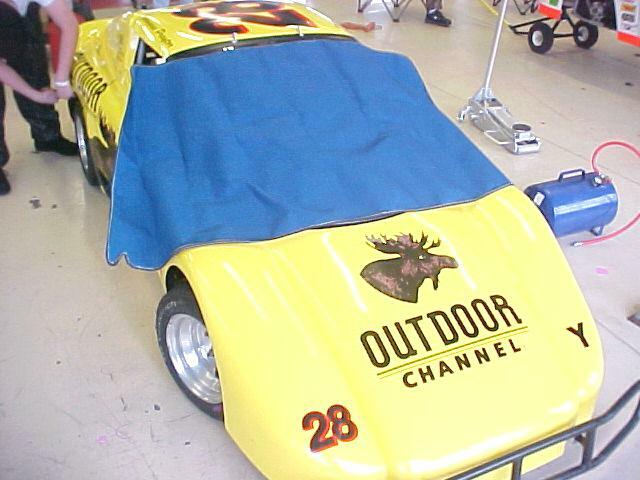 The Moose mixed it up early and often with the Outdoor Channel Legend car seeming to be in the eye of every storm. The action was wild but the Moose kept the his car in tact and came home with a 5th place finish. Thomas on the night, "Man it was crazy out there, they were bouncing off each other like pool balls. It seemed like 5 or 6 cautions happened right in front of me or beside me. We've had some good finishes but the guys coming in from out of town really step up the level of competition." 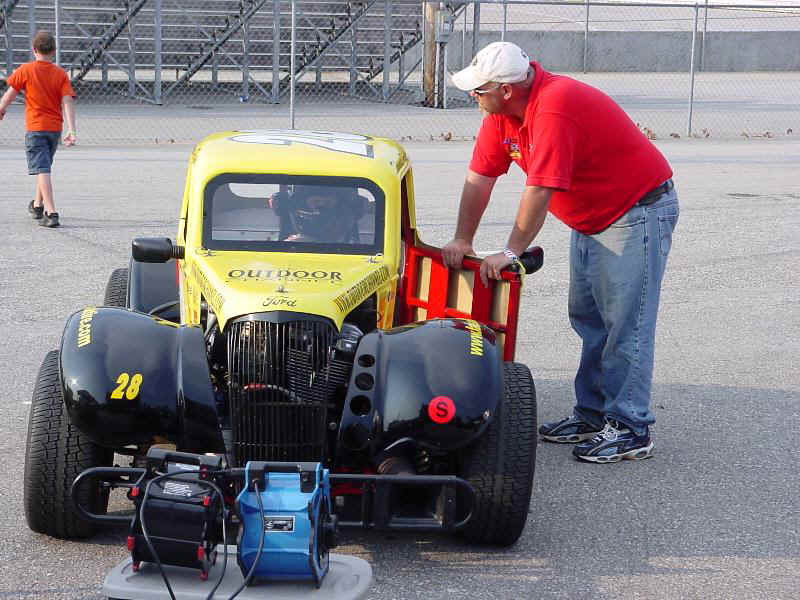 Picture is Thomas strapping in with help from Chris Hileman"
SSR 7-15-05-The third outing of the Outdoor Channel Bandolero netted 3 more top 5 finishes for the Moose this weekend at Sunny South Raceway. 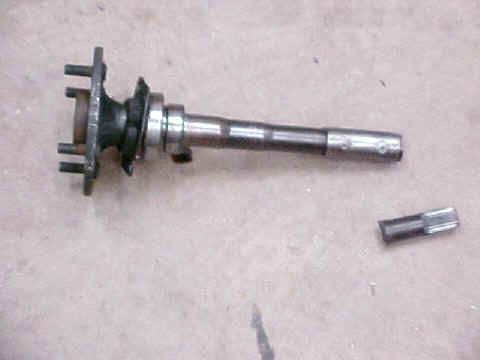 A broken axle in practice sent the team scrambling to get the car fixed and on the track for the first heat race and a 3rd place finish. With the bugs shaken out the Moose rumbled to a second place finish in the second heat race and earned a 4th place starting spot for the feature. The Moose horned his way to third and it looked like he would finish in the 3rd spot. On a restart, with 10 to go, the 4th place car jumped the start and it pushed the Outdoor Channel machine to the top of the track, going from 3rd to the tail end of the 13 car field. The car that jumped was black flagged but the race continued with the Moose scrambling to pick up lost positions. When the checkered flag flew he was back up to 5th and closing. Thomas on his night "That was the first time I've broken an axle, it made the car a handful. I didn't think we were going to be able to fix it but they got it done just in time for the first heat race. I was really hot about the deal on the restart in the feature, I felt like it cost us a good finish. I went to his trailer after the race, we talked it out and I think he knows how I feel about it. I'm looking forward to next Friday night." In just the second week in his Outdoor Channel machine Thomoose led his first laps in a legend car and scored 3 top 5's. With only 1 week of experience the Moose was competitive off the trailer and could run with the group that had been racing all year. The 2 heat races had him finish 4th and 2nd respectively and gave him an outside second row starting spot for the feature. On the initial start Thomas was pushed to the high outside groove and lost 4 spots back to 8th. The Moose really needed a caution to get the field bunched back up but the race went 25 green flag laps and he was able to work his way back up to 3rd when the checkered flag flew. Thomas on his night "I got hung out on the start and I just couldn't get caught back up. I was really happy with my car, we tested again this week and we tried some new stuff that made it really good. I have to thank the Leachman's, they let us borrow some parts for the race that was cool." Pic: Thomas's and Grandmother Jamie Praytor at the track. SSR 6-17-05: The almost 2 year wait to return to racing action at Sunny South Raceway looked like it might have to wait another week as a heavy line of thundershowers moved through South Alabama Friday night. After a 2 hour delay the rain relented and track drying efforts prepped the 1/4 mile high banked oval for racing. Finally, a little after 10:00 the Moose was lose in his return to SSR. The lack of seat time in his new car showed but his desire to go to the front hadn't changed. The checkered flag flew with the Moose in 3rd and round 1 was in the books. Round 2 was a 25 lap feature with both heat races combined for a full field of Legend cars. From the drop of the green flag the Moose was racing hard, searching for passing lanes inside and outside. The outside is a tough place to pass at SSR and the Moose put on a show racing side by side trying to make the outside work. When the outside wouldn't work it would cost him a spot or 2 and he had to work double to get back the spot he lost and pick up the spot he was trying to get. At the end of 25 laps the Moose was 5th and ready for another 25 laps. Thomas had the following comments about his outside groove racing, "I didn't think I was outside that much but everybody was talking about it, so I must have been. I really couldn't tell you what I did, I wanted to get in the top 5 and I was just racing as hard as I could to get there." The Moose will return to SSR this Friday night. Last night Thomoose wrapped up an intensive 2 week testing schedule for the Outdoor Channel Legend car and is ready to return to racing at Sunny South Raceway. It's been almost 2 years since the Moose raced at SSR and the last time didn't end very well. 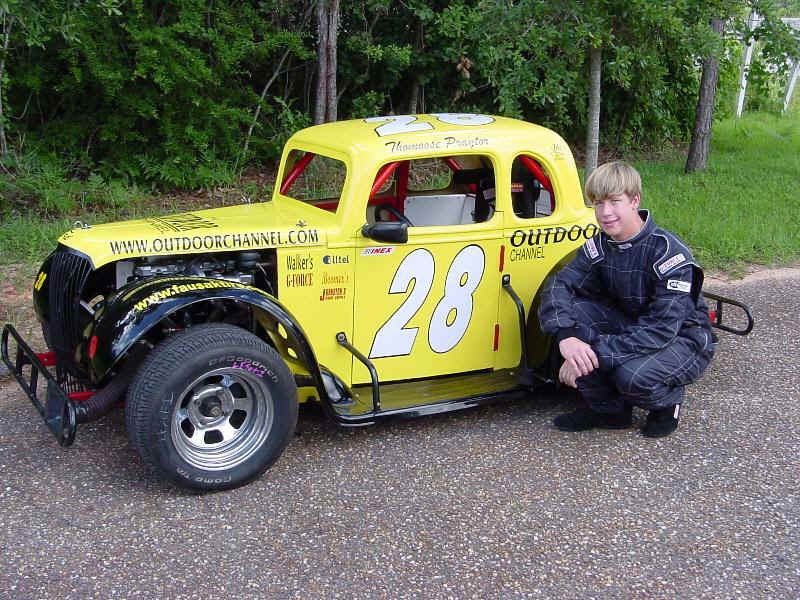 A turn 4 wreck left Thomas in a coma that kept him out of a race car for over a year. The Moose returned to full race status earlier this year in Atlanta but tonight will be his first start at SSR since September 19th, 2003. Thomas tested in a private test on Wednesday and again last night in an open practice session gaining as much seat time as possible. We'll turn the Moose loose tonight! 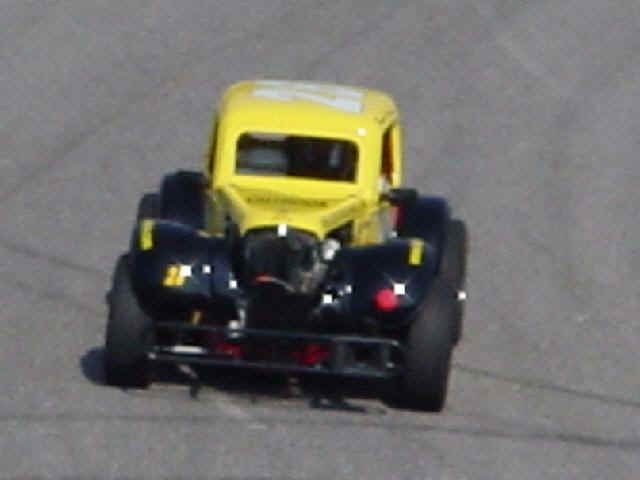 After a successful return to race status earlier this year in Atlanta, Thomas Praytor returned to Sunny South Raceway (SSR) to test the Outdoor Channel Legend car. The team had completed a 3 month tear down and rebuild of the former Texas State Championship car and the Moose shook the car down earlier in the week at Mobile International Speedway. 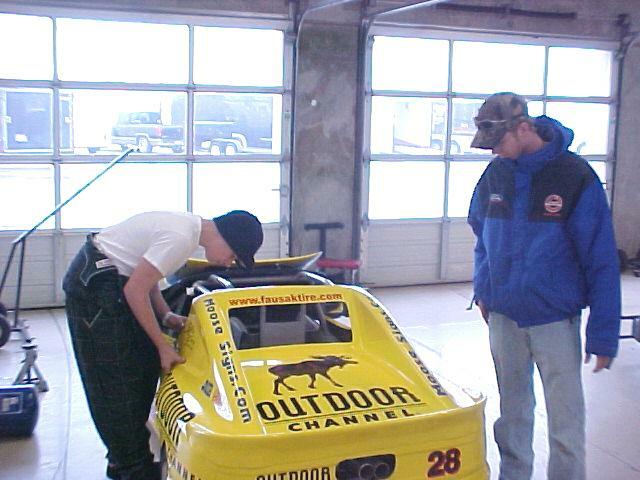 Thomas has hundreds of laps of experience at SSR but they are in his Outdoor Channel Bandolero not a Legend Car. 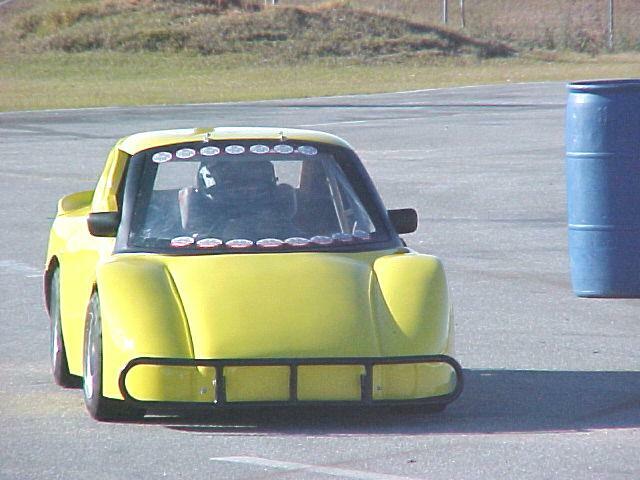 The Bandolero was powered by a 25 HP Briggs & Stratton motor, the legend car is powered by a 1250 CC Yamaha power plant. The 2 cars are like night and day. A five hour test gave Thomas plenty of time to get reacclimated to the racetrack and his new race car. 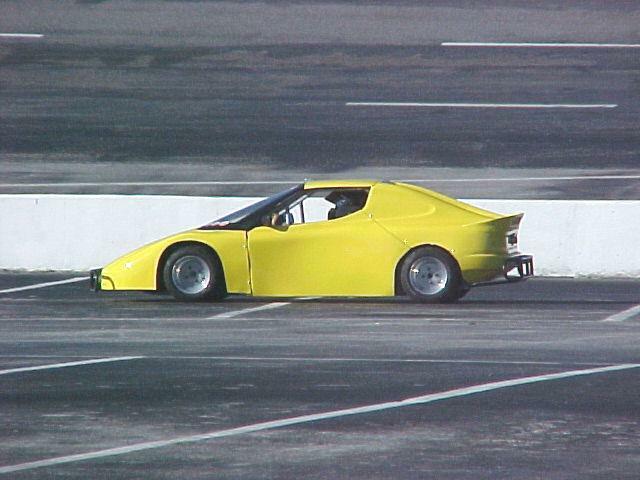 In the first segment the Moose put the car through its paces and was ready to start making laps at speed. With each segment the Moose got faster and within an hour he was power sliding off the turns searching for quicker lap times. By the end of night the Moose was a second and half faster than his first laps and was just 5 tenths off the fast time from the previous weeks winner. There are 2 more test scheduled before the Moose will make his first anticipated start at SSR this Friday night. 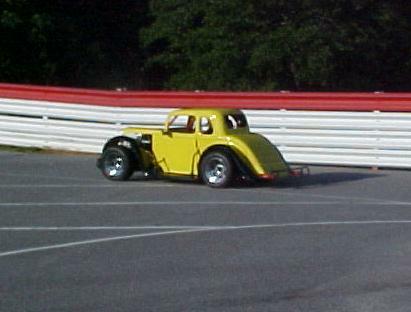 Picture is of the Outdoor Channel Legend car on track. 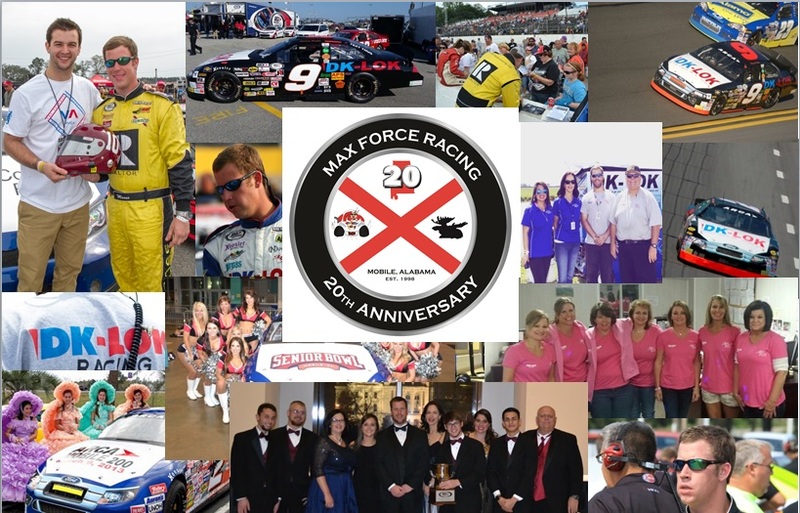 It has become a tradition at Max Force Racing to test new cars for the first time with no stickers. After a successful return to racing on the road course at Atlanta Motor Speedway (AMS), Thomas was looking forward to the 1/4 mile Thunder Ring at AMS but mother nature had other plans. Early afternoon showers canceled racing for the Bandoleros and the Thunder Ring would have to wait until February. 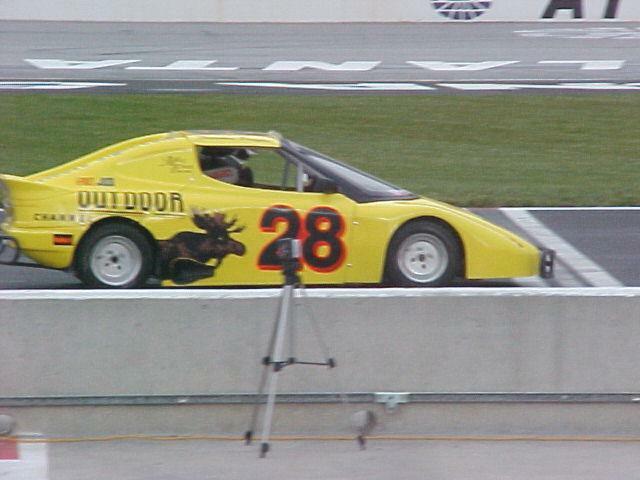 Too bad, the Outdoor Channel Bandolero was quick in practice and the prospects of mixing it up on the 1/4 mile oval had the Moose on the loose. 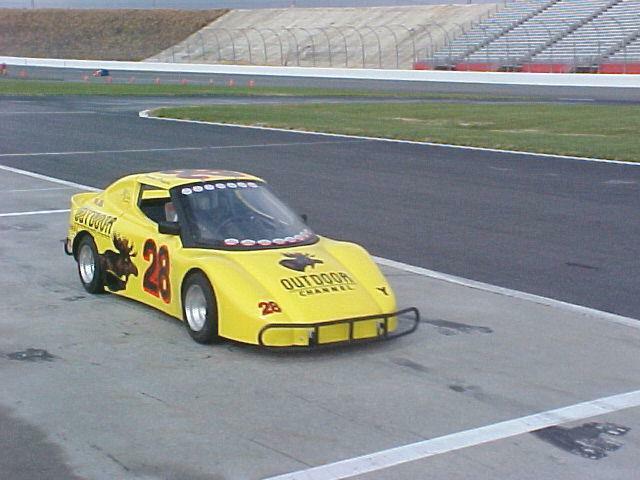 The Outdoor Channel Bandolero is scheduled to be back in action on February 26th at the Thunder Ring at Atlanta Motor Speedway. Adam Crawford watching Thomas do the only work he did all day. Rain cancelled what would have been a good day. It had been over a year since Thomas and the Outdoor Channel Bandolero had seen race action and the last race didn't end too well. A positive test in Mobile pointed to a successful return to race status but after the long lay off and the hit that put him there, one big question mark remained; How would he react with other cars? That was quickly answered when he started passing cars in the practice session, first using the inside line and then the outside. The Moose was on the loose and ready to race! 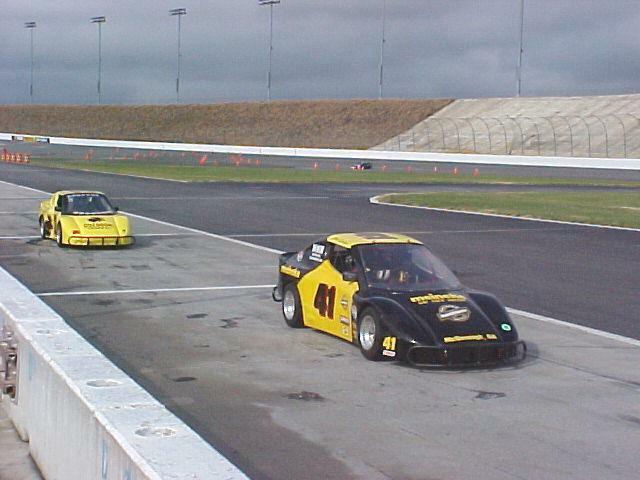 Atlanta and Charlotte are known as 2 of the toughest Bandolero tracks in the country. If you want to know how you stack up, you can try either track and you'll be racing against the best there is. 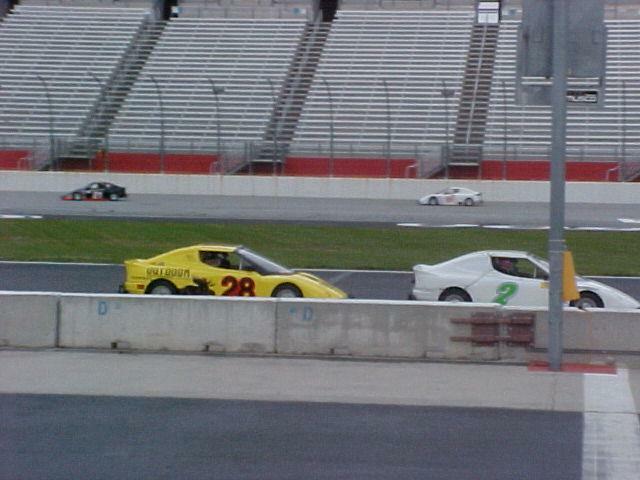 The road course is especially difficult and over 20 Bandoleros were in attendance for this installment of the Georgia Winter Flurry Series. The green flag dropped on the field with the Moose starting in the 7th position. The first chicane requires some serious give and take, the Moose had to give a little too much and settled into 10th as the field made the first left hander down into the infield at Atlanta Motor Speedway. Thomas would quickly take back the spots he gave up and pick up another to move into 6th place. The Moose was turning laps faster than the leaders but passing cars allowed the leaders to gain an advantage that couldn't be overcome and Thomas would wind up 6th, a nice top 10 for his first race back. 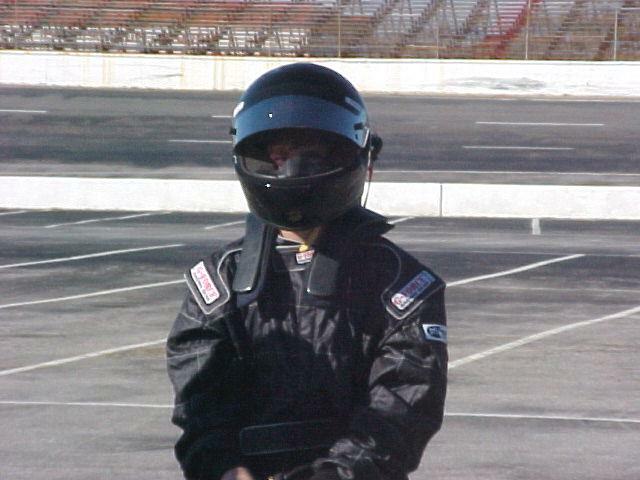 The last year has been the longest Thomas has been out of a race car since he started racing at 8 years old. 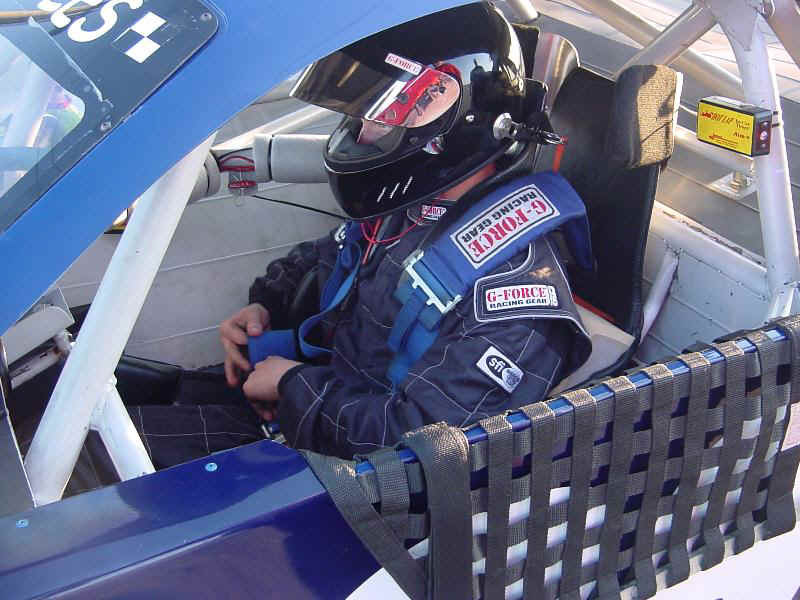 Thomas returned to football action in September and has spent the last 3 months finishing the rebuild of his race car that was destroyed on September 19th, 2003 at Sunny South Raceway. This past weekend the Moose made the next step in his return to full race status with a test of his Outdoor Channel Bandolero. Mobile International Speedway was converted from a high bank 1/2 mile bull ring to a 1 mile road course in preparation for 1.5 mile road course at Atlanta Motor Speedway. The pit area normally home to 70+ cars for a regular Saturday night show became the inner loop and the racing surface added 3 more turns to the improvised road course. There were a lot of questions to answer in the 1 day test. The car had been completely rebuilt with each piece replaced or reworked. Our driver had been out of a car for over a year and the last time didn't turn out very well. The driver question was answered first. Thomas was given instructions to take about 6 or 7 laps on the inner loop at half speed to shake the car down. He didn't make 2 laps and he was wide open, power sliding off the turns. After the first segment we turned the Moose loose on the road course and he spent the rest of the day putting The Outdoor Channel Bandolero to the test. Both car and driver came through with flying colors. Thomas is scheduled to return to full racing action this weekend in the Winter Flurry Series on the road course at Atlanta Motor Speedway. 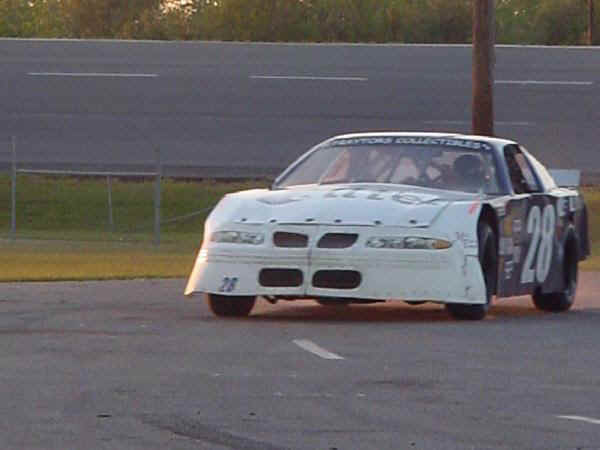 Picture attached is of The Outdoor Channel Bandolero on the make shift road course at Mobile International Speedway. The car has no stickers because it has become our race teams tradition to test a new race car clean until it earns it's stripes. The windshield on the car carries the 15 feature win decals from Sunny South Raceway and it is the only surviving piece of Thomas's championship car.